AMBASSADOR'S BLOG - IS UKRAINE FREE? Which is the country which is most free in the CIS? Can we say confidently that it is Ukraine? Or how about a new pretender to that crown – Moldova? There are many ways to measure freedom, some more objective than others. As I noted in a recent blog on human rights, one can often get a feel for the degree of freedom in a country as soon as one arrives at the airport. But such impressions are inevitably subjective. That makes the Freedom in the World 2011 Survey produced by US-based non-governmental organisation Freedom House, an important document. The survey attempts to form an objective assessment, giving countries scores of between 1 (good) and 7 (bad) for political rights and civil liberties respectively, producing a potential top score of 2 and a potential bottom score of 14. It then groups countries into Free (scoring 2-5 points); Partly Free (6-10); and Not Free (11-14). 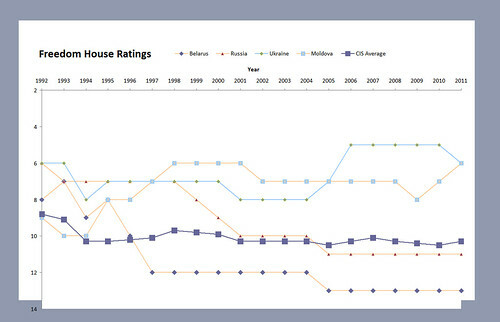 In 2005 Ukraine became the first, and so far the only, CIS country which Freedom House classed as Free, with a score of 5 for the period 2005-10. For 2011, Ukraine’s score slips by one point to 6, placing it in the “Partly Free” category, with the same score as Moldova. Moldova, meanwhile, is on an upward trajectory having seen its score rise from 8 in 2009 to 7 in 2010 and 6 in 2011. Freedom House explains the fall in Ukraine’s score by “deteriorating media freedom, secret service pressure on universities to keep students from participating in protests, government hostility toward opposition gatherings and foreign non-governmental organisations, and an increase in presidential influence over the judiciary”. - whatever your opinion of the methodology, Ukraine’s descent into the “Partly Free” category will reinforce concerns about the development of democracy and freedom of speech. The fact that the country has slipped only one point shows that there is everything still to play for and – I hope – that Ukraine can restore its position in the “Free” category next year. The challenge for the Ukrainian authorities now is to do everything they can restore Ukraine’s “Free” rating by demonstrating respect for political rights and civil liberties in the year ahead. If that means we are now going to see a fierce competition between Ukraine and Moldova for the title of “Most Free Country in the CIS”, so much the better.